Embroidered Happy Birthday Teddy Bear - 20"
Smiles and happiness is what you’ll see with this Happy Birthday Plush Teddy Bear! 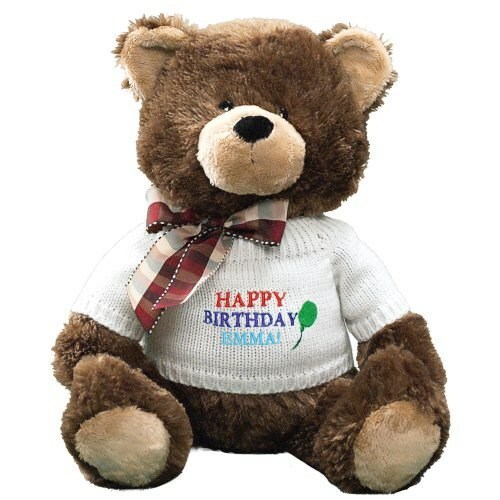 Our teddy bear is wearing a warm and cozy, white sweater that is embroidered with our happy birthday design. It is a sweet treat for anyone celebrating a birthday! This lovable teddy bear is a classic, soft and fury bear from Gund. It has rich dark brown fur and contrasting tan fur on the snout, ears and feet. A red bow tied around its neck gives it a wonderful look. The bear measures 20” and includes free personalization of any name. We will also include free gift wrapping and a free gift message to help create a thoughtful presentation. Additional Details Make someone’s special day even better with Plush Birthday Bears and Stuffed Animals from 800Bear.com!